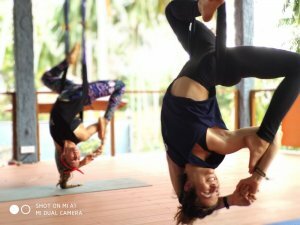 We’re so excited to invite you to join us for FlyHighYoga aerial yoga classes here at Talalla Retreat – either as a drop-in class or on one of our 7 day / 6 night Yoga Retreats. 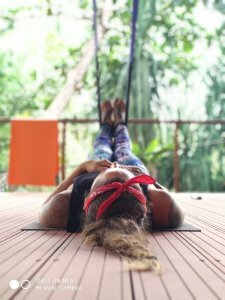 Our Yoga Manager Tye Fielding recently visited the founding studio in Ubud, Bali and has brought her expertise and passion back to Sri Lanka to share with us all. FlyHighYoga is a popular and new style of aerial yoga. It started in 2012 in Ubud, Bali with the development of the FlyHighYoga Belt. This belt is a simple and unique tool for a gravity defying, creative, fun, precise and alignment-based style of yoga. FlyHighYoga is therefore a bridge to good physical, mental and spiritual well-being for all yoga practitioners. 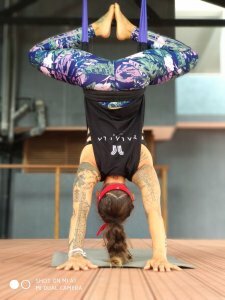 FlyHighYoga is appropriate for all general healthy people: more or less active, with bigger or smaller flexibility capacities, regular and advanced yoga practitioners, as well complete beginners. Our 7 day / 6 night Yoga Retreats run weekly, with 4 different themes of abundance to choose from; Fall In Love With Your Practice, Energy Body Exploration, Recharge & Renew and Elemental Experience. We also offer 15% discount when booking two weeks (14 days). Specialty Workshops – Occasionally, our teachers will also offer drop-in specialty workshops with topics ranging based on our teachers’ special interests. Topics may range from Introduction to Meditation, Sound Healing, Myofascial Release, Partner Yoga and more.